since I posted a card. This time, though, I spent some time Thursday clearing off my mess and was able to actually sit at my table and stamp and color for a little bit. That was nice (I don’t know why I don’t do it more often)! Here’s part of what I colored. The rest will have to come over the weekend – they’re all DTGD works-in-progress and by “progress”, I mean they’re in bits and pieces everywhere and once again, my table is covered in paper scraps and there’s glitter all over the place again . . . This week’s sketch came from Laurie (find it here), and I really did follow it, but then ended up tying a bow over the separation between the polkadotted papers. Really, it’s there! 🙂 See what Beate, Cami, Charmaine, Laurie, Lori, and Sharon did by visiting their blogs . . . I’m off to do some last minute running around before heading to sunny Orlando, Florida for CHA & the Craft SuperShow on Tuesday. I cannot wait to see the cool new stuff, hug my friends (both new and old!) and just recharge my creative batteries. Only a few more days. . . Will you be there? I am sorry. I am cracking myself up over here. LOVE the card. Gorgeous colors, gorgeous stamps and gorgeous coloring! See you in 6 days!!!! Wohoo!!! Hugs, grins and happy dance! I’ll be there! SEE YA SOON!! LOVE your card Jenn! I’m jealous your table is cleaned off. 🙁 Have a great weekend! So we were channeling the orange today? Love your poppies…. beautiful job with the sketch. Can’t wait to see you soon! Hugs!! So stunning, Jenn!! Love the deep colors and that yummy double ribbon!! Oh wow, I love your take on the sketch Jenn!!! I LOVE this card, Jenn. It definitely has a WOW factor in my eyes. OH MY Missy this is just awesome! 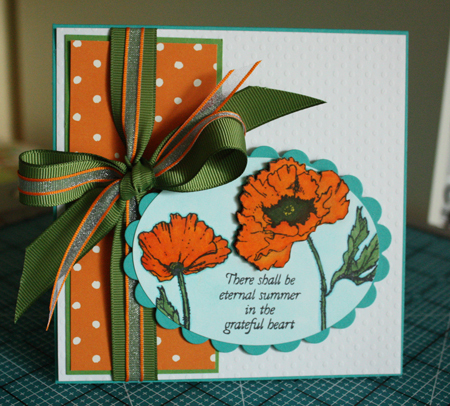 Pretty poppies, Jenn, and wonderful texture on this card. Have fun at CHA and take a cut-out photo of me so I can have fun, too (wink)! Gorgeous colors! I love the ribbon combo & the sentiment. Beautiful poppies!